April's favorable weather encourages plenty of festivals and events to be staged across Texas. In fact, some of Texas' most unique festivals are held in April. You can head for the beach and watch the sand sculptors at work, enjoy the huge and colorful Fiesta San Antonio events, and find some art for your home at an open-air street festival. April is a great time for food festivals, boat shows, and outdoor music. The annual Strawberry Festival draws over 100,000 visitors to the tiny town of Poteet near San Antonio. This event, which has been held for over 70 years, attracts nationally-known country music stars and Tejano entertainers in addition to the carnival, art show, rodeo, dances, parade and “Taste of Texas” food show. The festival promotes Poteet’s major crop—strawberries which are now an endangered crop. The annual berry fest has become a major tourist attraction. Held each year in Houston, the Bayou City Cajun Fest includes plenty of Cajun cuisine, live Cajun music, entertainment, and more. Given its close proximity to Louisiana, Houston has long had ties to Cajun culture and the annual Bayou City Cajun Festival showcases this part of Houston's heritage. 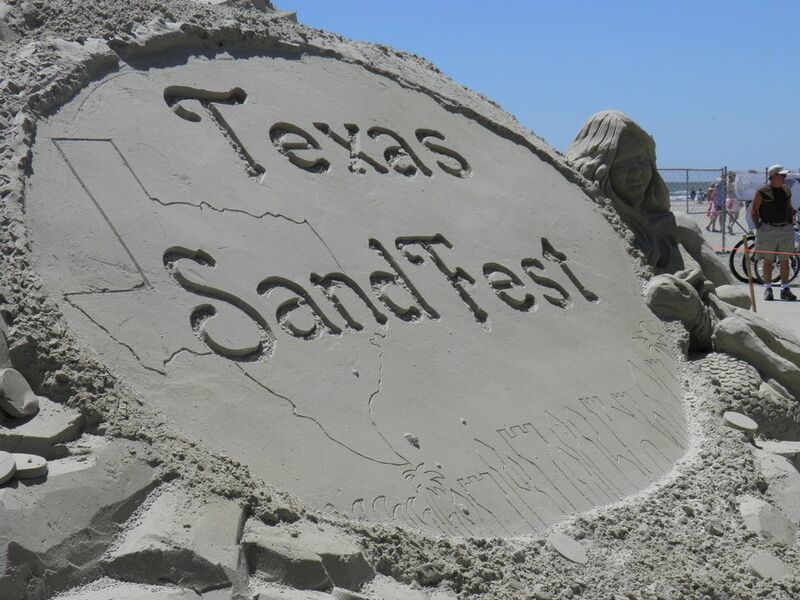 Sand sculptors from all over the world make their way to Port Aransas each year for the annual Texas SandFest. The events include sculpting contests for professionals and amateurs, food, a beer garden, and live music. Portland's annual Windfest is a weekend full of fun events such as a children's fishing pond, chili cook-off, horseshoe tournament, washer tournament, 5k and 10k runs, parade, clowns, live entertainment fun events such as a baby contest and talent contest. The Southwest International Boat Show takes place at the South Shore Harbor Marina in League City near Houston over four days each April. This in-water boat show has the largest display of new and previously-owned powerboats in Texas. Fiesta San Antonio is a massive festival featuring over 100 different events. Some of the most popular are the 10k and kids' runs, Fiesta Oyster Bake, Fiesta Mariachi Mass, Roundball Ruckus, the arts fair, carnival, and A Night in Old San Antonio. There are several exciting parades including the Texas Cavaliers River Parade, the Fiesta Flambeau Parade, and the Battle of Flowers Parade which has an interesting history as the first Fiesta San Antonio event. This colorful parade commemorates the victory of San Jacinto and has been going on since 1891. Austin's annual Reggae Festival features world music, arts and crafts, and international food. Held at Auditorium Shores, the event benefits the Capital Area Food Bank. The three-day festival brings attracts top dub, roots, and ska acts from around the world to the venue in downtown Austin. Fort Worth's Mainstreet Arts Festival features hundreds of artists displaying and selling their wares. The festival also features live music, street performers, food vendors, and family activities. You can stroll nine blocks of amazing art and food booths. The 2019 Artist’s Gallery lists the 223 artists participating in this year’s show. Held each year in Georgetown, just a short drive from Austin, the Red Poppy Festival features a "Red Poppy Ride" car tour, live music, car show, children's activities, a parade, and more. It's all about poppies and the event even features the “Red Poppy Taste Awards,” for a cooking competition featuring all things poppy. There are categories for chefs and amateur cooks.